The whole health care system in Japan is different to what I grew up with in the UK and it still baffles me somewhat at times. In the UK, you are registered with a local doctor, a GP who has your full set of medical records. If you are ill no matter what it is your first step is to call your GP and make an appointment, your GP will then decide whether it is something minor, if so he/she will prescribe you meds and off you go. If they suspect it is something more serious they refer you to a specialist. If you need emergency care then you either go straight to the A&E (accident & emergency) which is usually housed in one of the big hospitals or call an ambulance and they usually take you to the nearest A&E. Thanks to the NHS everyone is seen to, you don't need insurance. If you work in the UK you have to make a month contribution to the system, if you need a prescription it costs you £7.40 no matter what it is for and if you are a child, OAP, pregnant or disabled it is free. 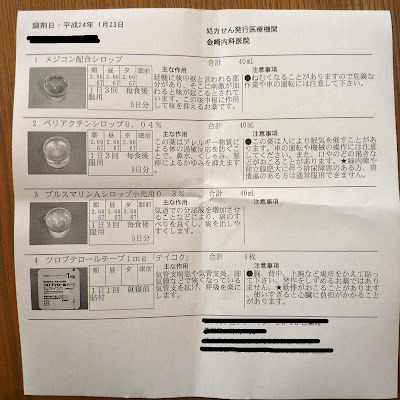 Over to Japan, if you get sick the first thing to do is a bit of self diagnosis then you get out google and find your nearest doctor that specialises in that field, so if you think you have an ear infection you look up your local ENT doctor. Usually you don't make an appointment, you just rock up to the doctors then sit in the waiting room for however long it takes. As in the UK the doctor will refer you to a specialist higher up in the chain if they think it is needed. Also, like the UK, the doctors do a special course so that all their handwriting is illegible! Here each doctors office that you visit will have a record of your medical history from that office so there is no nowhere that has all your medical files in one place. This worries me because the doctor has to rely on what the patient tells them, they are unable to see what has been the problem in the past. It is also not the culture to question the doctor in any way, shape or form, some will actually get quite stroppy with you if you do! 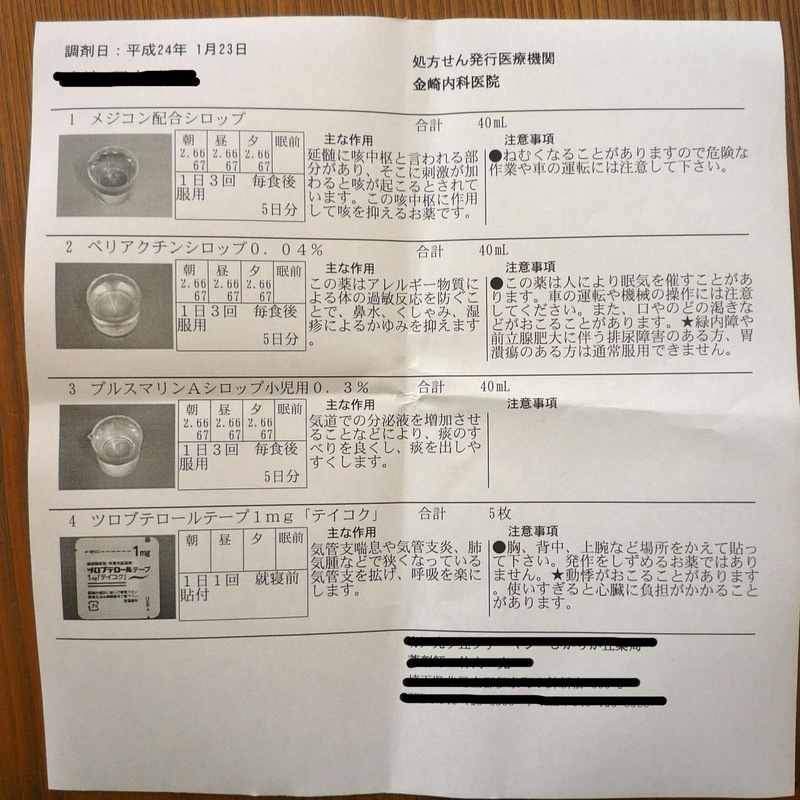 You also need insurance in Japan we pay through my husbands company, so you need to have your insurance card and you doctors registration card (kids also have a third card) each time you visit the doctor. You do have to pay for your prescription too but only 30%, kids are basically free, I had to pay ¥100 for Ebi-kuns last prescription. I dread the day we need to call an ambulance, many think it is better to make your own way to the hospital. Due to the insane address system here often ambulances have a hard time finding the address, most ambulance crew are NOT paramedics and so can only make you comfortable whilst they get you to the hospital. Then there is the decision of which hospital to take you to and there is no guarantee that the hospital will admit you when you get there. When Ebi-kun broke his arm a neighbour took us to the local doctors clinic, I was confused why because I didn't know that they had a x-ray machine and they also do a lot of rehab mainly for older people, thankfully she knew this and decided it was the best place to go. So, all that said, in my personal experience, I have nothing to complain about and always received great care over here. What started this post is that Ebi-kun has had a bad cough, he usually gets them in winter, it's no biggie. I took him to the local kids doctor, it isn't usually as busy as the other doctors nearby and the younger doctor speaks a smidgin of English (he knows all the words I know in Japanese lol). The doctors usually only give medicine for 3 days, of course Ebi-kun is still coughing so it is back to the doc for him this morning. Above is his prescription, the top three are mixed in one bottle to make the syrup and the bottom is a patch that goes on his chest, like a nicotine patch but it releases medicine instead. I don't remember getting such a details breakdown of the meds when I was in the UK - although it is a long time since I visited a doctor back there. So, now your turn, what is the health care system like where you are? We live in Canada (Ontario) and our system sounds similar to the one in the UK. We have a family doctor, who will refer us to a specialist when needed. If you need to see a doctor in the evening or on the weekend, you go to the walk-in clinic, or if it is an emergency, you go to the emergency ward at the hospital if you can get yourself there or call an ambulance if you can't (the law is that all vehicles have to pull off to the side of the road and stop to allow ambulances with their lights on to pass by). Also, you have to remember to bring your health card otherwise you have to pay for the visit. The health care system is paid for with income tax dollars and other provincial income. Basic things are covered by having a health card like a plaster cast or a ward room at the hospital (4 people in a room), if you want say a fiberglass cast, or a semi-private or private room at the hospital, you have to pay for it out of pocket or if you have additional health coverage ("benefits") through your employment then these items might be covered by them instead. I love our system as I've never had to worry about where to go, or what the cost would be and what if we couldn't afford it. I'm very grateful. I know the UK are having problems with the NHS at the moment but i do think that when it is running smoothly (and they have enough money) it is a great system, sounds like your system runs well too. We live in Portugal and the main system is equal to the one in UK and in Canada. We pay our taxes that are supposed to feed the NHS. this is a very fair system because anyone has access to health services. However, is a system that begins to fail for lack of self-financing: people of working age that contribute with their taxes, are not sufficient to pay the entire health system with an increasingly aging population. So, this reality will soon be very different. we also have private health care system, which is parallel to the public one and which resembles that of Japan. Some companies offer health insurance to their employees, which is our situation, and so we can go to private doctors. The private system is faster, but good specialists are still in the public service. The ideal situation for portuguese people today is having both systems. Of course not everybody can afford this but everybody has medical assistance when needed. it always seems to be lack of money that causes the problems doesn't it? or if you have plenty you can 'buy' the care you need. When I first arrived in Japan, I was surprised that there were no GPs . Had a good laugh when a Singapore friend working in Nara told me that she was being referred to an ENT specialist by the Internal Medicine Specialist Doctor to treat a simple sore throat. Things in Australia are sort of a mix of Canada and the US. There are things that must be paid for up front and things that have no upfront cost. You can elect to see private doctors/specialists but if you don't have private health coverage you have to pay a fee (some of which you get back). A lot of your basic services are bulk-billed which means no upfront cost. With Rx medications some of them are subsidised by the government. One annoying thing though is that doctors can't (or don't?) write repeating prescriptions for things longer than 3 months. So if you're on a long term medication you have to go back all the time to get a refill. Same goes for a standing lab requisition (ie: if you get the same lot of bloodwork done monthly), my doctor said they don't do those either so I'd have to go in and make an appointment with him to get a lab sheet, do the labs and then I was expected to make another appointment after a week to get the results. One plus with this system is that there doesn't seem to be an overly long wait for diagnostic imaging. I've never had to wait longer than 24 hours for an appointment (at home there can be very long waits). Some specialists are hard to get into though and you can wait a month or more depending.